Daniël Maarleveld , is an Amsterdam-based graphic designer and typographer. He also creates evolving letters and whole alphabets, like our project logo. 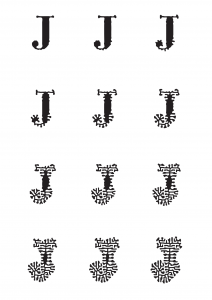 He created the Evolving J and we asked him to design the 250 Miles animated logo based upon that. The letter has such a strong association with street patterns – the grid of the “250 Miles crossing Philadelphia” project. Daniel works together with a number of different designers, programmers and artists to create typefaces, books and websites. In some of his work he is searching for unexplored possibilities of new or existing techniques based on mathematical natural or mechanical principles. This result is work that balances between machine and hand made work.